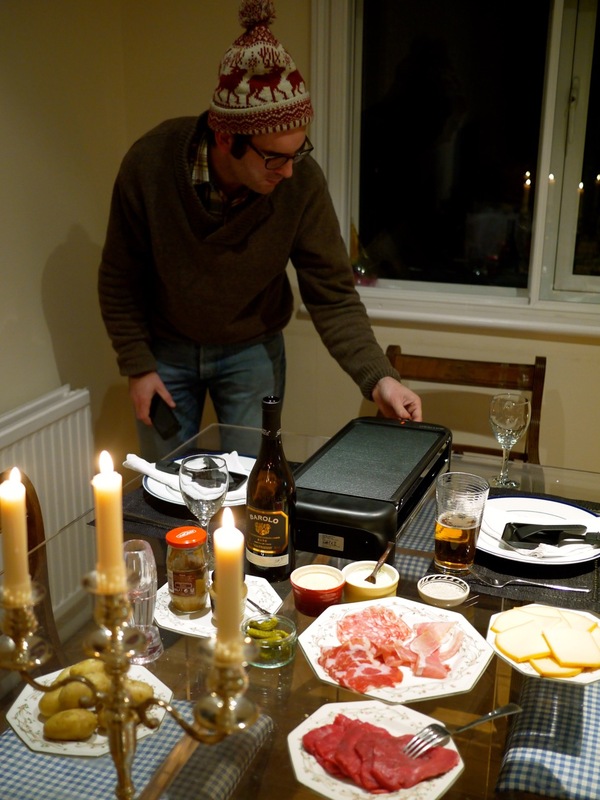 This weekend I finally got to rev up one of our wedding presents, which is, quite simply, the greatest thing ever – a raclette grill. 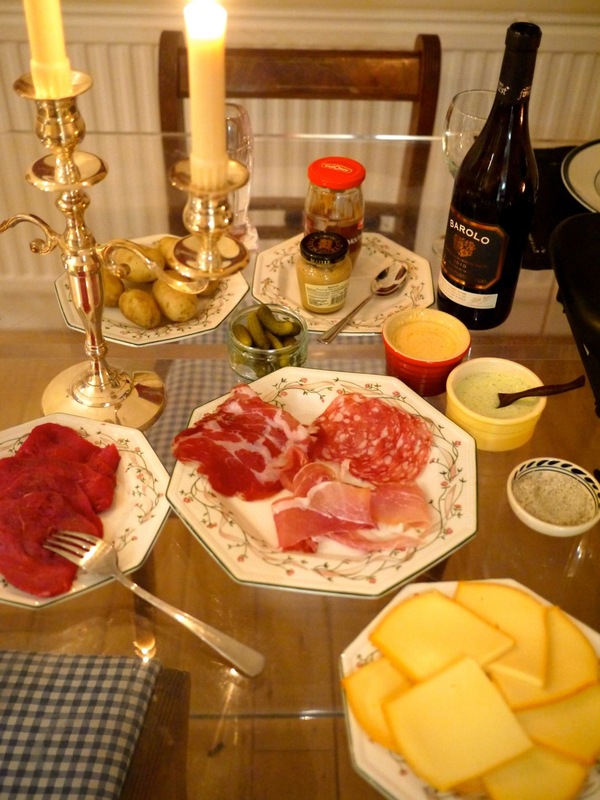 For the most part, the Swiss are quite happy being Swiss, enjoying their lives in Switzerland. They don’t really get involved, except to offer the world some first-rate luxury exports from time to time – namely, chocolate, watches, and Roger Federer. I like that their national motto is the same as The Three Musketeers’, “One for all, all for one” and their foreign policy is sensibly isolationist. 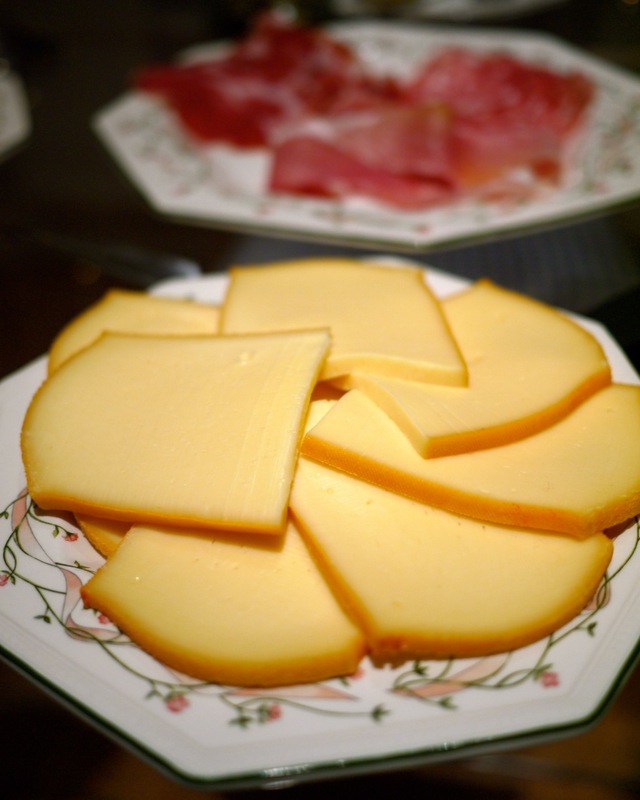 One thing the Swiss aren’t neutral about, though, is cheese. They rock at it. 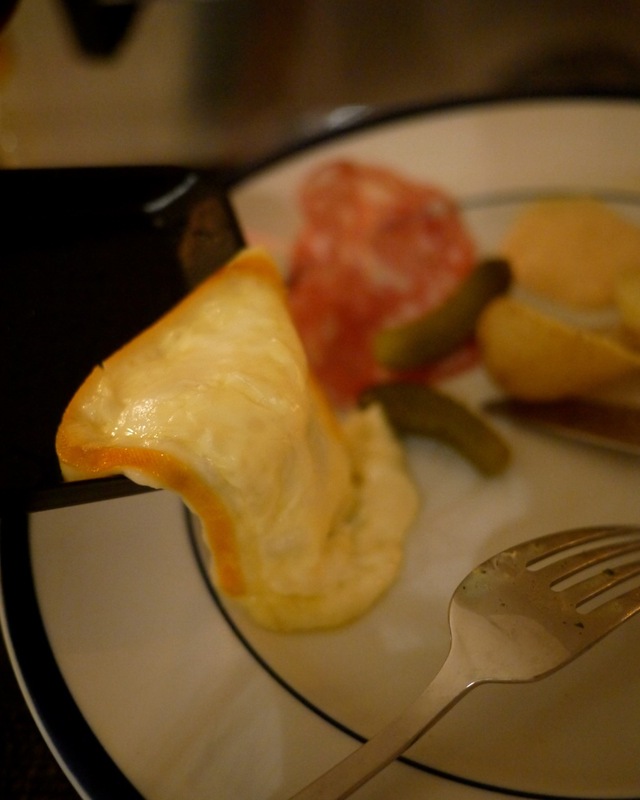 They take cheese to another level. 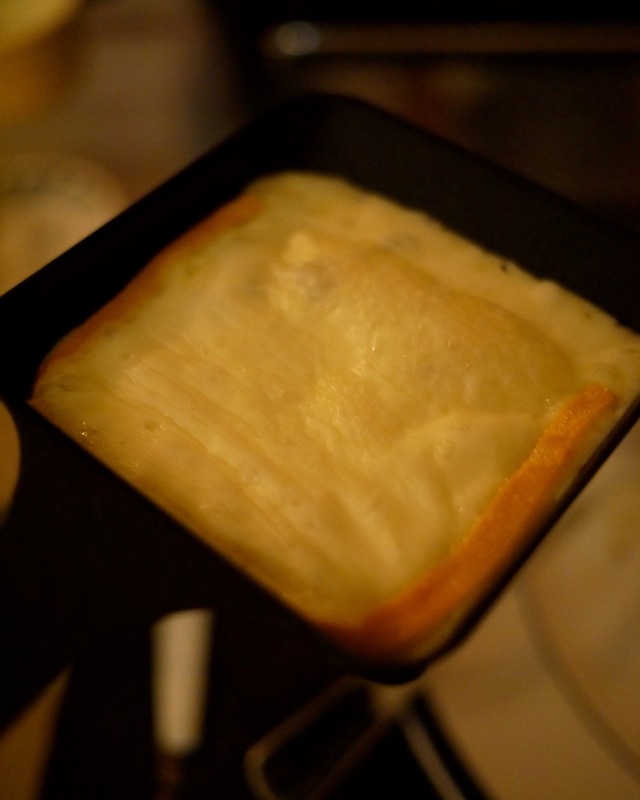 And they invented the cheese-melting machine of my dreams, the raclette grill. 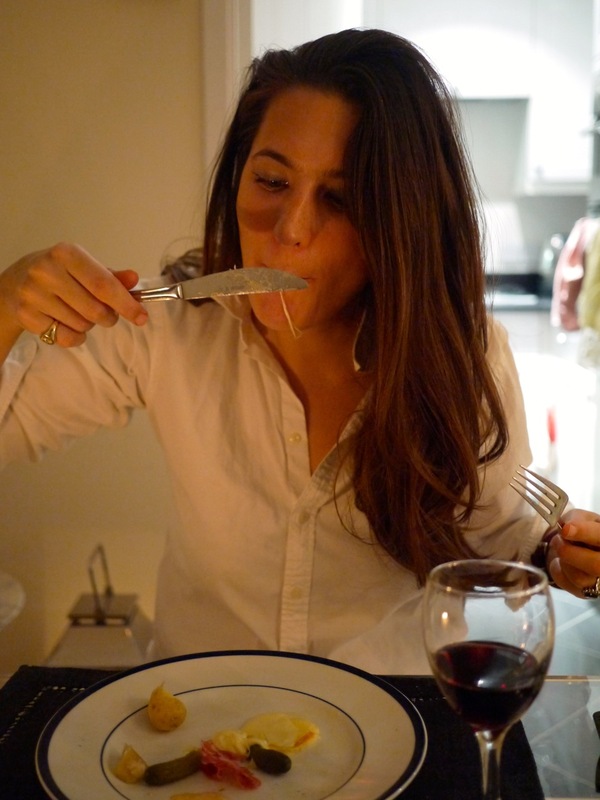 This addition to our household was such an occasion, I had to blog about it! 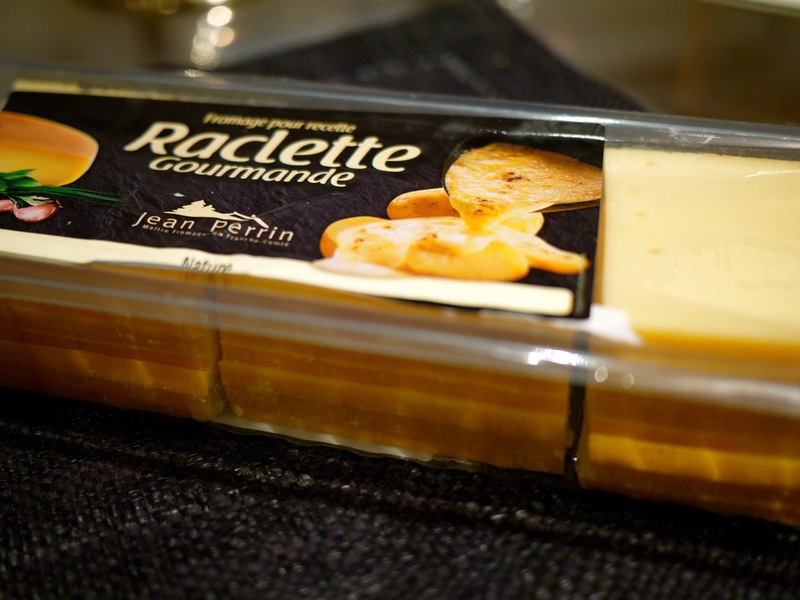 You can get raclette cheese in pre-sliced packages. The little squares fit perfectly into the trays, called coupelles. 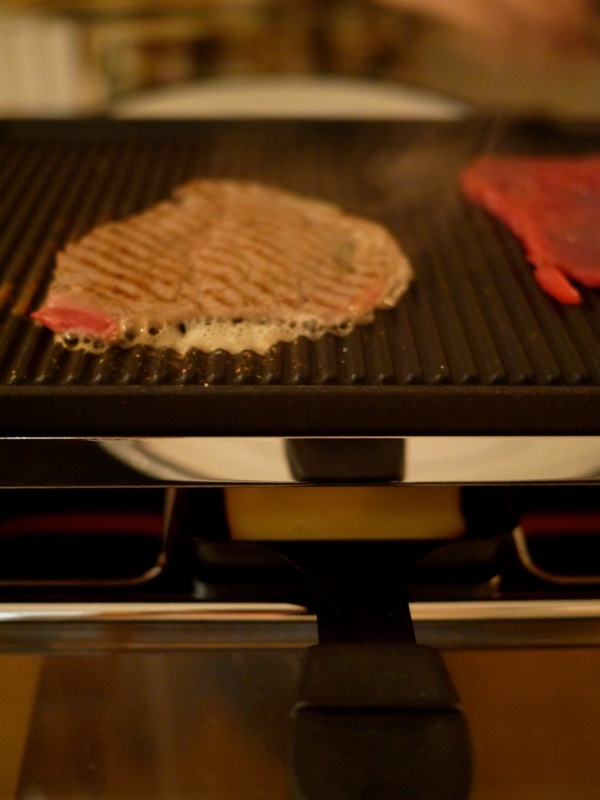 Another major component is the meat, which gets seared on the top griddle. 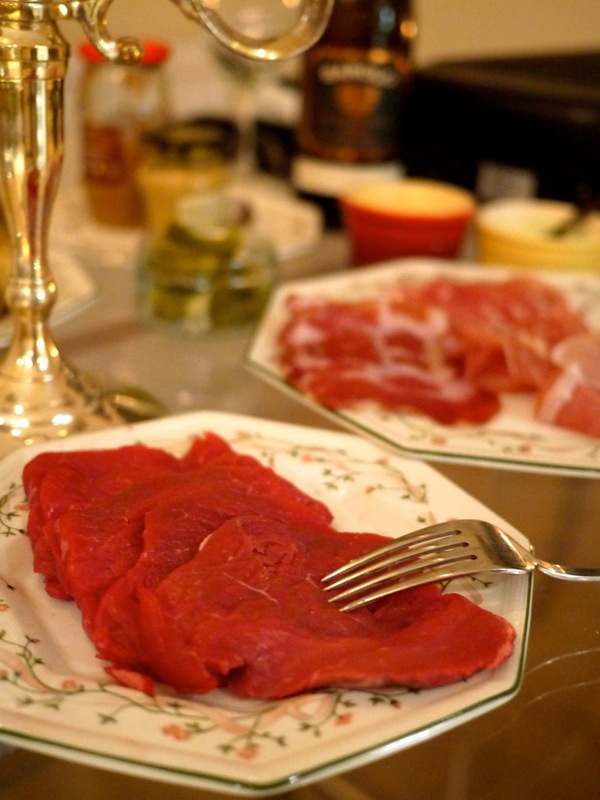 We got the butcher to cut some thin slices of filet mignon. 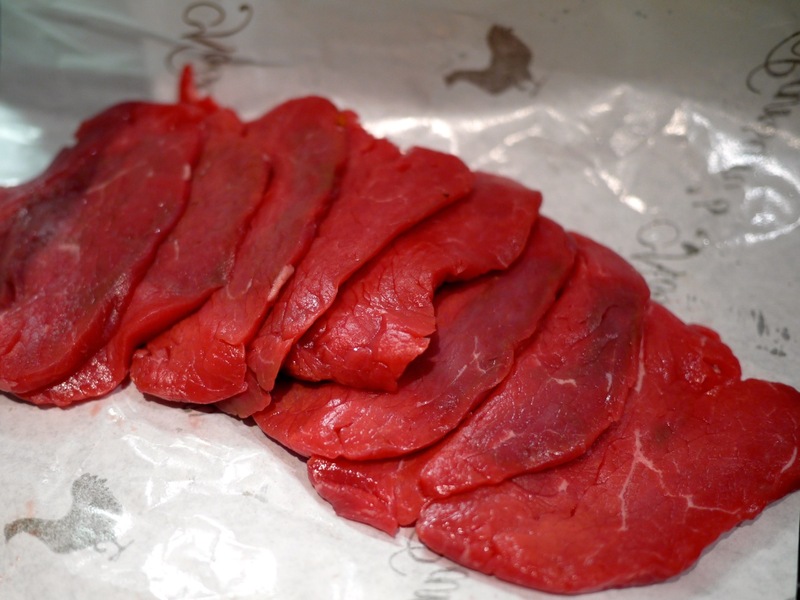 You can marinade it in advance, but we chose to simply salt and pepper it as we go. 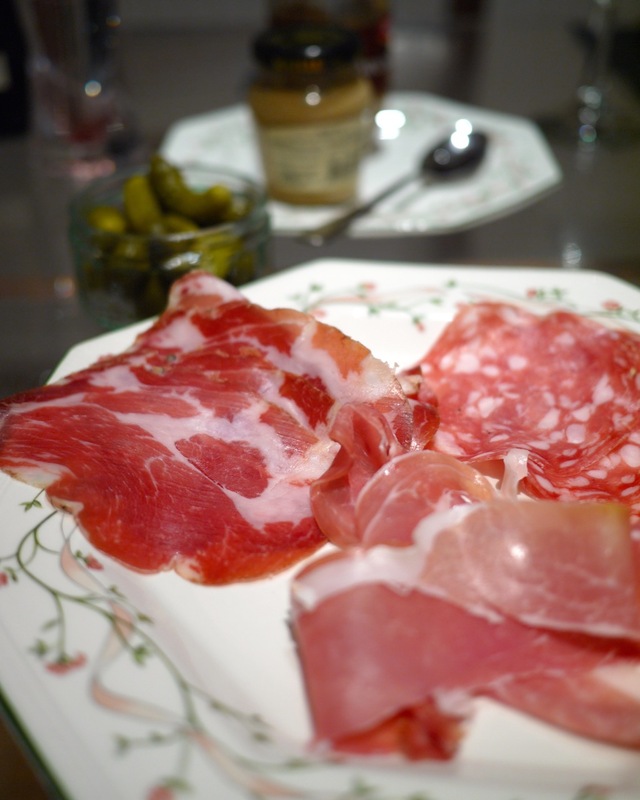 The accompaniments are also important: a charcuterie of cured meats, boiled potatoes, and cornichon are the main ones. 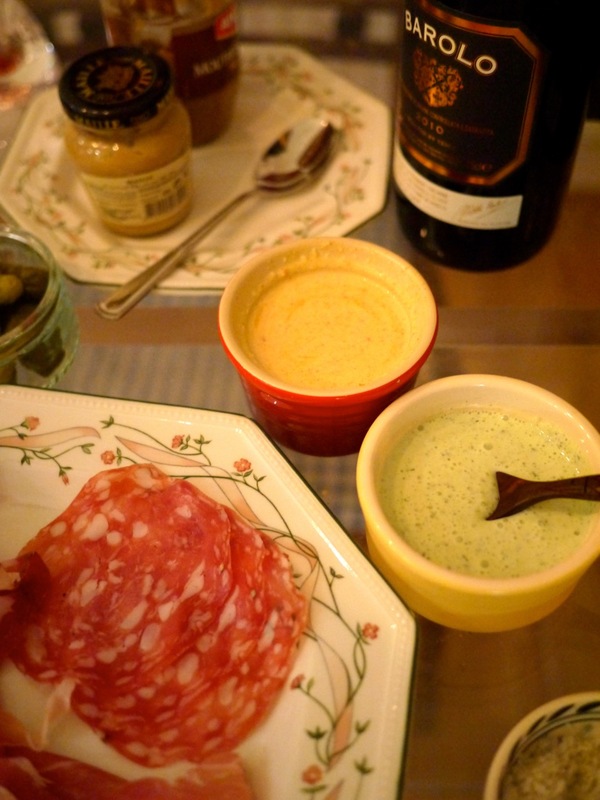 The Hubster even whipped up a pair of condiments – a creamy curry sauce, and an herby yogurt sauce with dill, basil and cilantro. 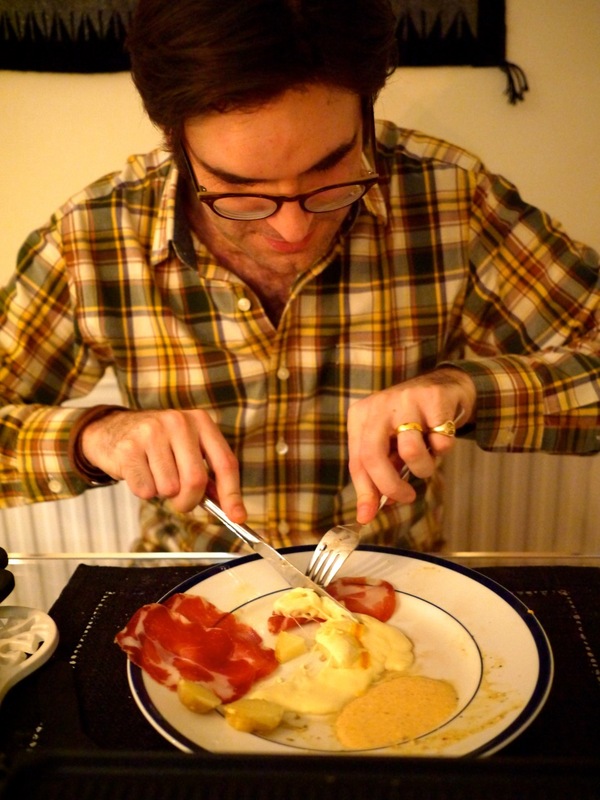 Nothing left to do but switch on the raclette grill! It’s so perfectly compact, and ideal for the tabletop. 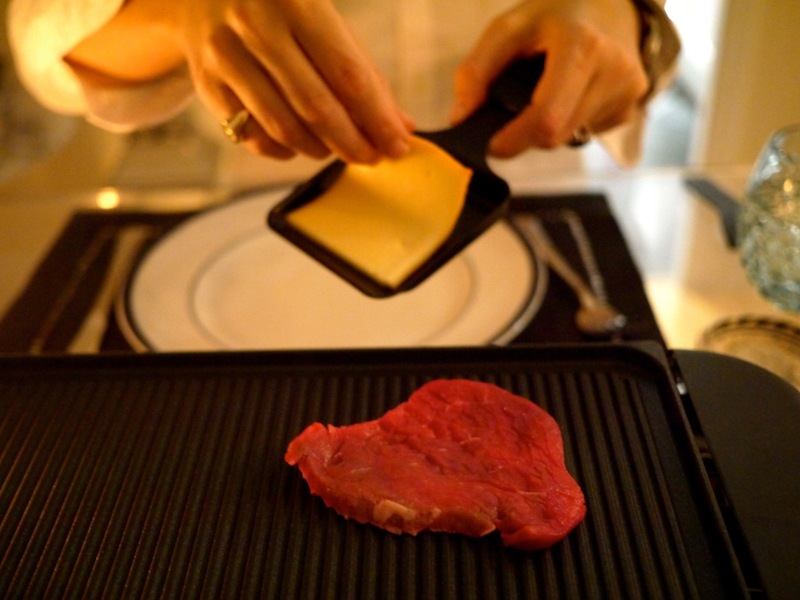 Bop a piece of steak on the hot grill to sear, while the tray of cheese melts on the grill below. 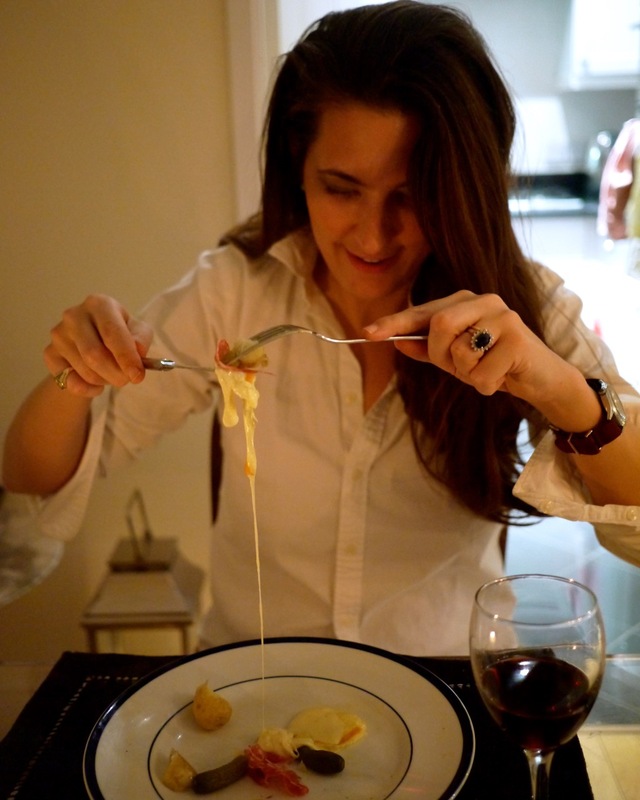 When you hear the cheese start bubbling, just remove the tray from the heat, and pour onto your plate! Preferably over potatoes, or whatever else happens to be in the way. 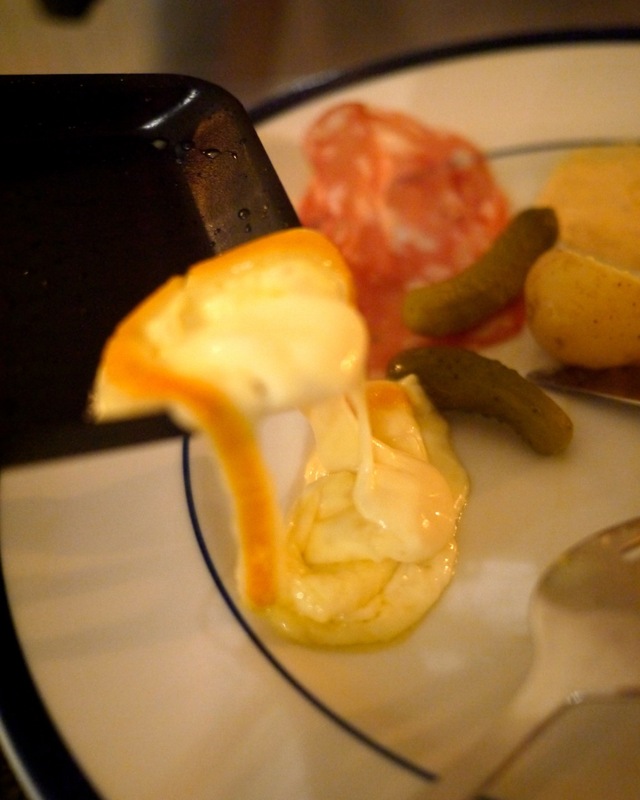 Well, there you have it: the most amazing invention a true cheese lover could ever hope for. 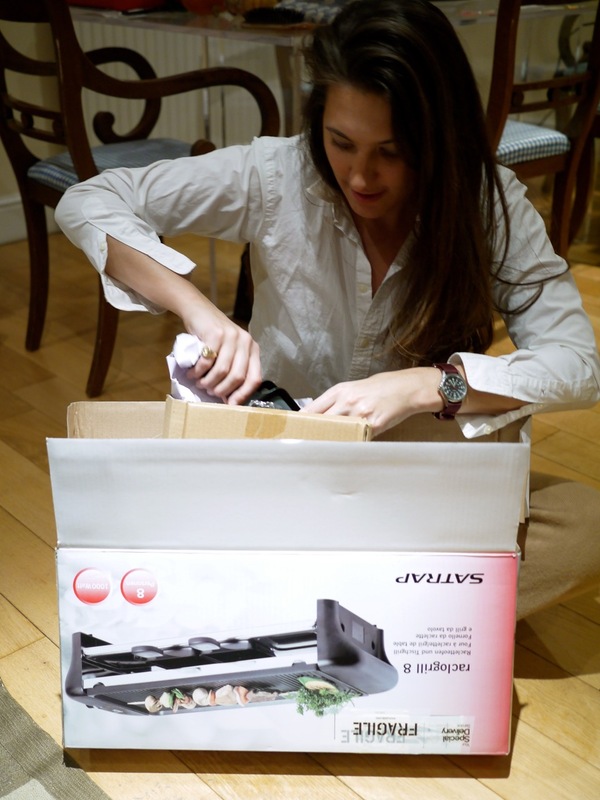 And a gift that will keep the sizzle in our marriage for many years to come! 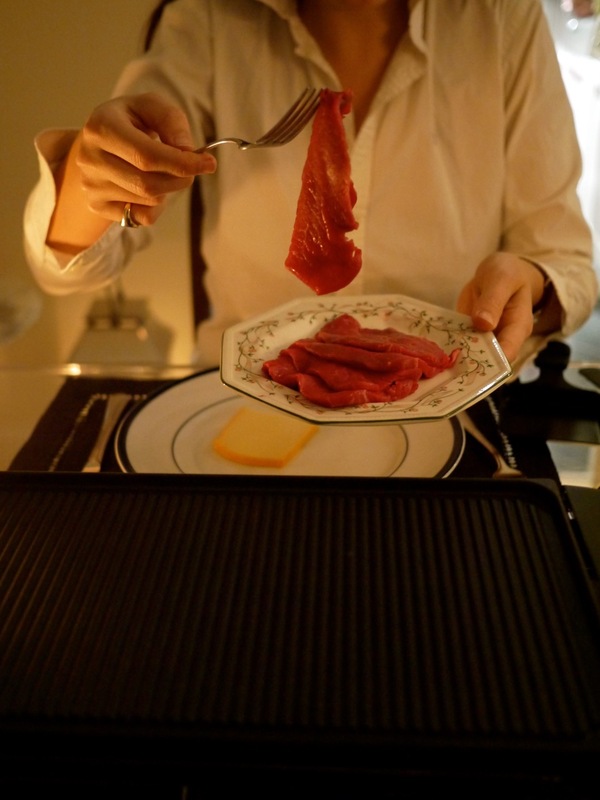 This entry was posted in Food and tagged accompaniments, candlelit, charcuterie, cheese, curry sauce, dinner, filet, food, grill, herby yogurt sauce, raclette, sauces, sliced, steak, Swiss, tabletop, wedding present on January 19, 2015 by godsavethescene.